Bullshift: Helping companies achieve more from interactions in their workplace. Learn how to get more openness, honesty and straight talk at our Bullshift Workshops. Register your interest and we will keep you informed of upcoming dates and locations. Openness, Honesty and Straight talk. We use humour, wisdom and empathy to help you shift the bull. 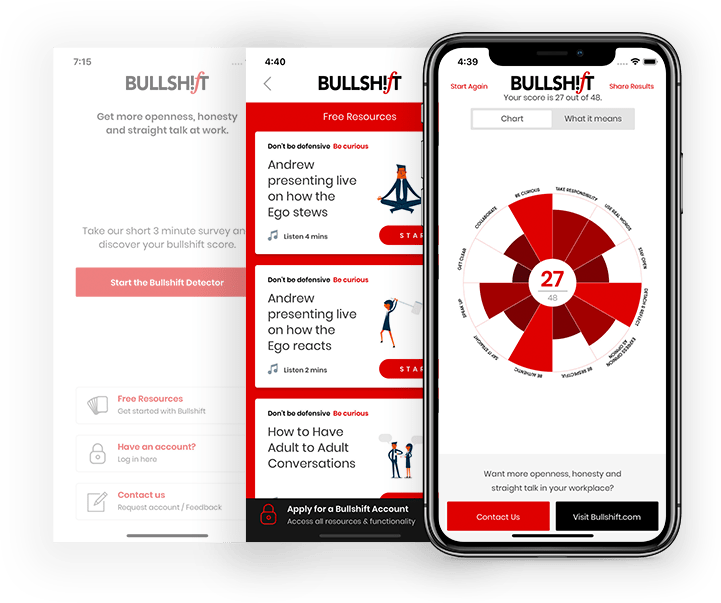 Bullshift was created to help organisations, leaders and individuals get more openness, honesty and straight talk within their workplace and within their life. The feedback on you has been overwhelmingly positive, so thanks again for making the day such a success. The Bullshift Company is managed by Andrew Horabin and Malcolm Dix. We help companies adopt the Bullshift principles through humour, honesty and courageous self-inquiry. We do this through Keynotes, Workshops and our online learning platform, Shift Practice. Excited to take your team growth further after working with the Bullshift team? Grab the app today and login to get access to even more great resources. I looked around the room and saw every single person leaning forward, smiling, engaged and wanting more. “Don’t be defensive, be curious” hit hard with everyone in the room but the delivery was light-hearted and funny. This has been a talking point since we attended the workshop and we will definitely be embedding the principles into our workplace. One of the best learning exercises I have seen. Delivery was spot on.